We are just now developing this department of the business and some of these plants may not be available. They are available thru special order and we can get them for you. We will not ship during cold weather to insure that you receive a health happy plant. 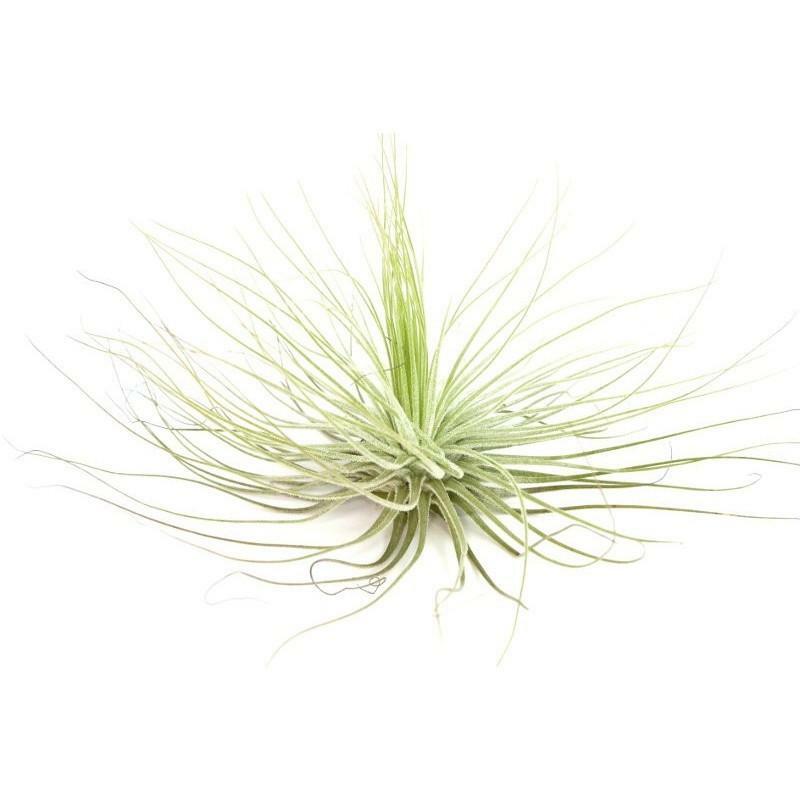 Often referred to as the "Queen" of the air plants, this spectacular Tillandsia Xerographica plant is the most stunning plant we have. 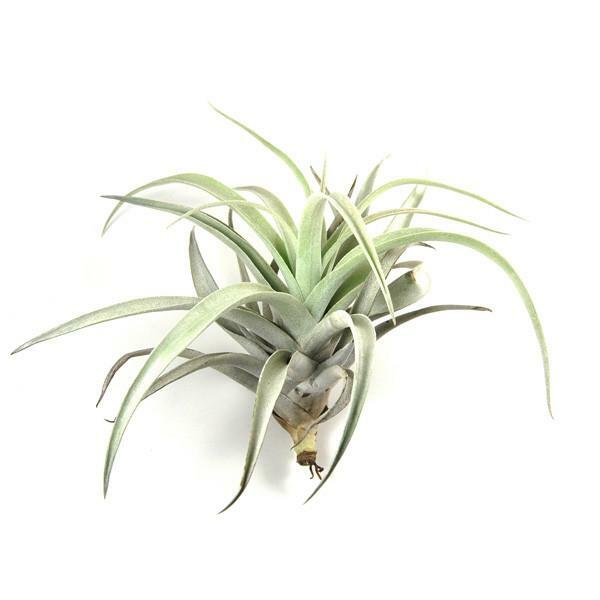 Silvery light green in color, Xerographica is one of the more rare varieties. It's thick, wide leaves form a tight rosette of curls with the thin, spiky new growth sprouting from the center adding a beautiful contrast in form. Sizes vary. Perfect for smaller terrariums, driftwood, and cork. 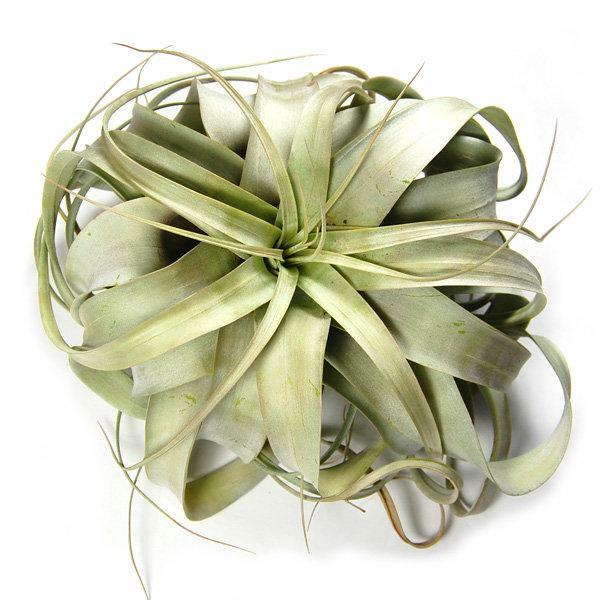 The Ionantha Guatemala is a classic and adored air plant. 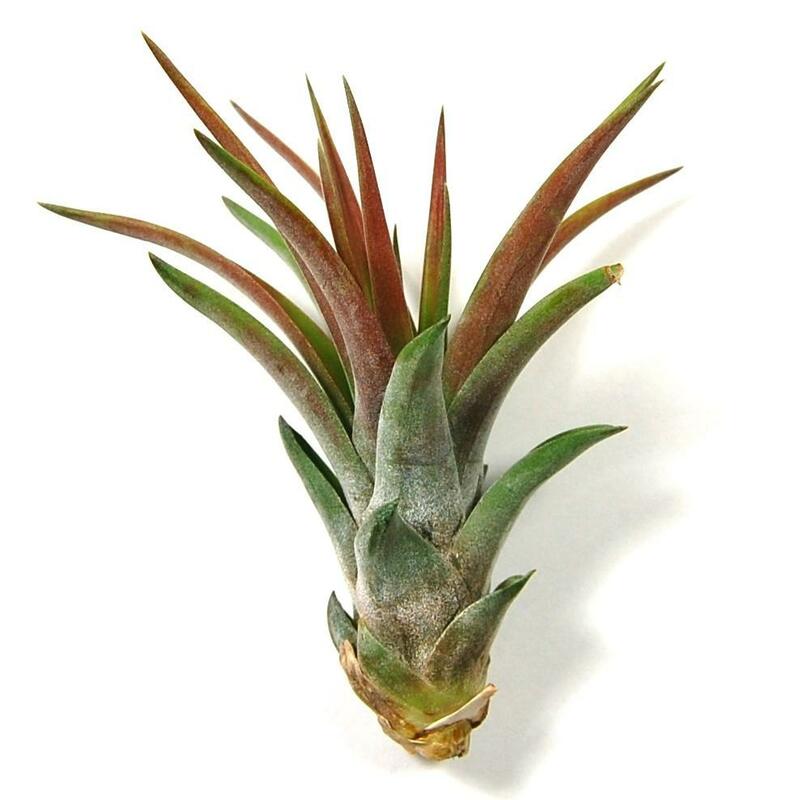 The Ionantha Guatemala has thin, spiky leaves with many trichomes on them. The trichomes give the leaves a white or silvery look. When in bloom these little guys display a blushing beautiful red to orange color with purple tubular flowers. The main picture displayed is what the plant looks like when in bloom. They bloom 2 to 3 times per year. It is very exciting when they burst into color! 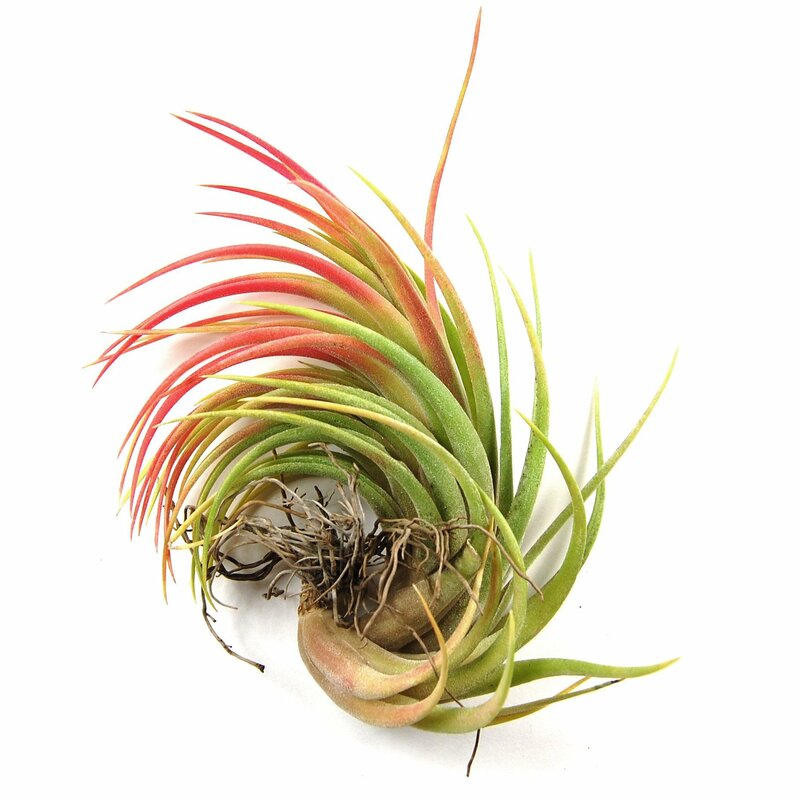 Heather's Blush is a large, showy hybrid air plant. It's leave are curly, smooth, and shiny green. When in bloom, this species glows a gentle pink. 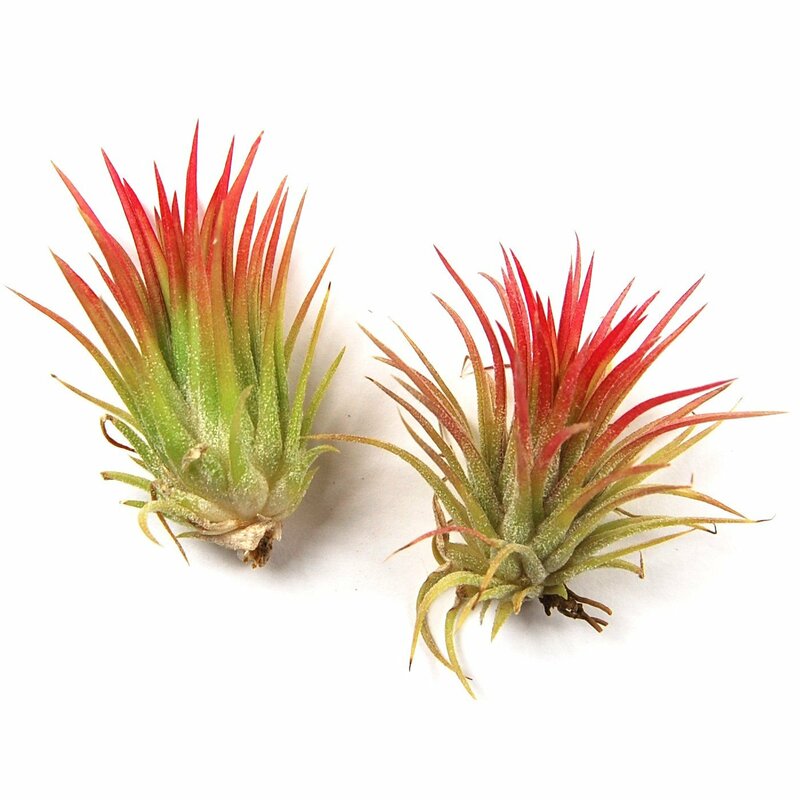 Ionantha Rubra are closely related to Ionantha Guatemala but have softer leaves and less trichomes. Trichomes are very tiny scales on the leaves that give them a white or silvery look. The trichomes help the leaves hold moisture so it can be absorbed. These are perfect for small seashells, terrariums under 5 inches, cork bark, driftwood and any other medium. They are very hardy and average about 2 inches tall. They will grow as large as 3 to 4 inches and multiply by producing "pups" from their base. They will give you wonderful blooms 2 to 3 times per year. These plants are not in bloom... the picture displayed is what the plant looks like when in bloom. They bloom 2 to 3 times per year. It is very exciting when they burst into color! 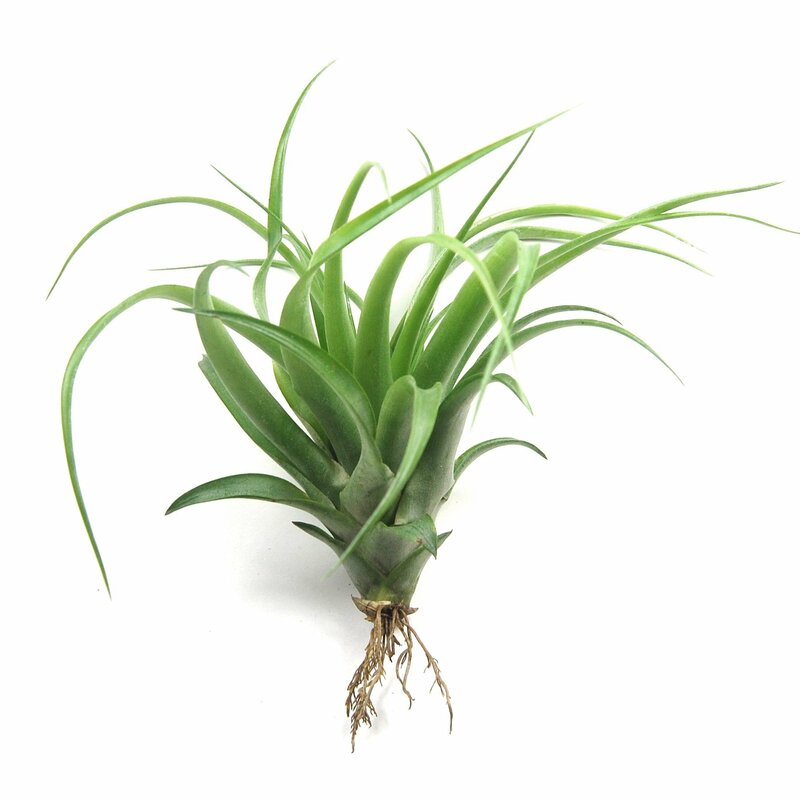 The Ionantha Mexican has short thick leaves that are vibrant bright green. When in bloom, these little guys display a blushing beautiful red to orange color with purple tubular flowers. They are great for crafts, terrariums and mounting. 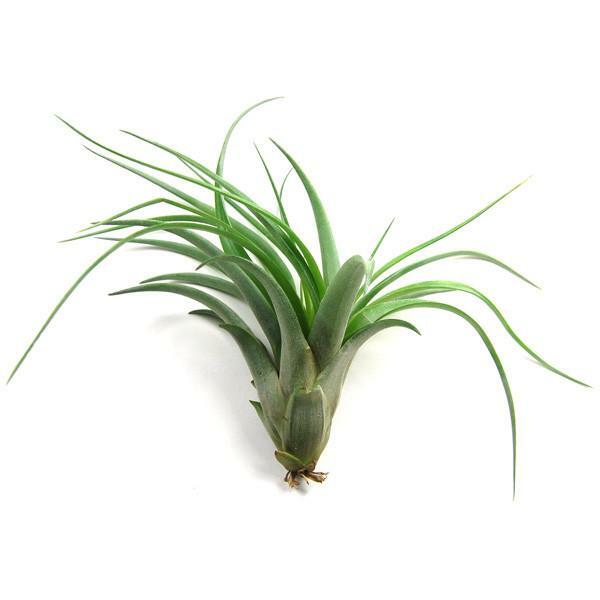 Our Abdita Brachycaulos plants are 4-6 inches tall and 3-5 inches wide. Their normal color is a bright green but when they bloom their leaves blush a vibrant red. Our current batch of plants have an attractive, thick green leaf! Versatile plants that are great for displays and terrariums. If you write us an order note, we will do our best to send some bloomers, we have many available! Velutina is as pretty as its name. Dark green leaves curve out of its base in wide arcs. The leaves are soft and velvety. When they bloom their leaves blush in many shades of yellow and pink before sending a thick purple bloom stalk. 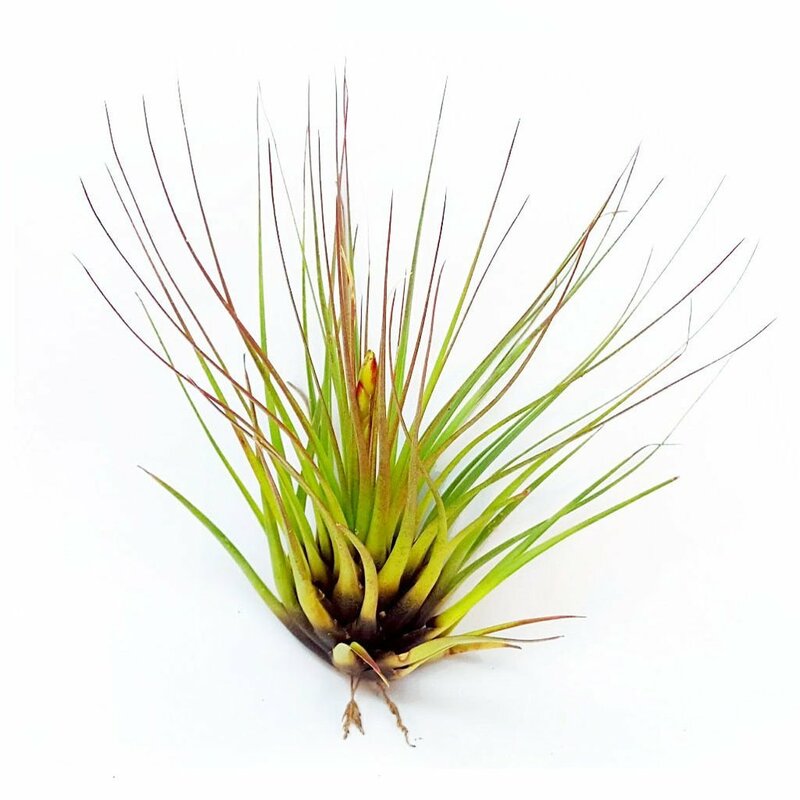 Our Velutina are 4 to 6 inches wide and 3 to 4 inches in height. These spiky guys like to twist and turn in all directions. 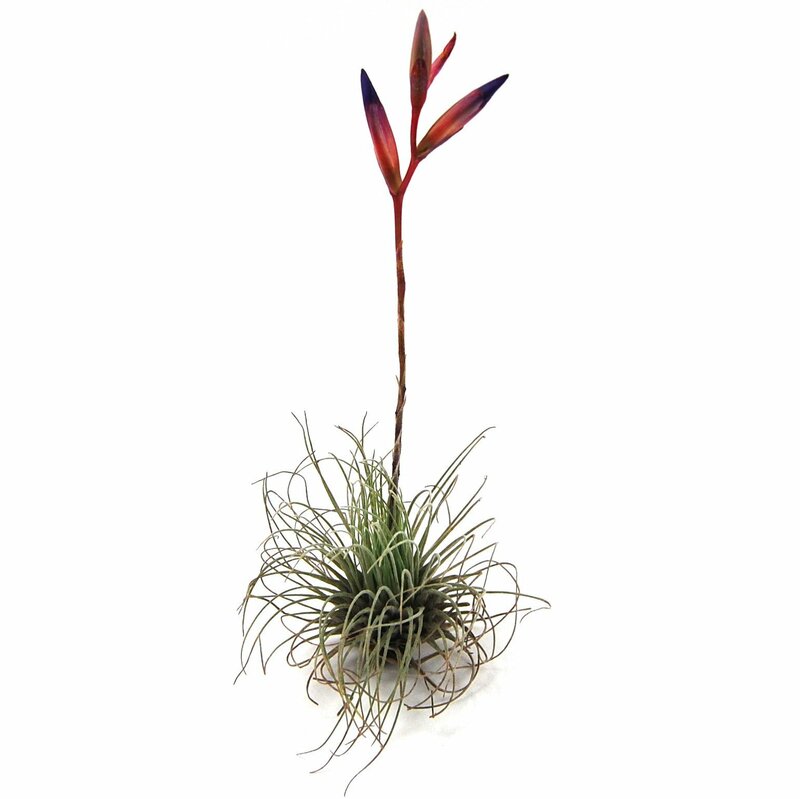 Mostly grassy green in color with a woody base, the Funckiana plants develop a bright red bud and flower when in bloom. 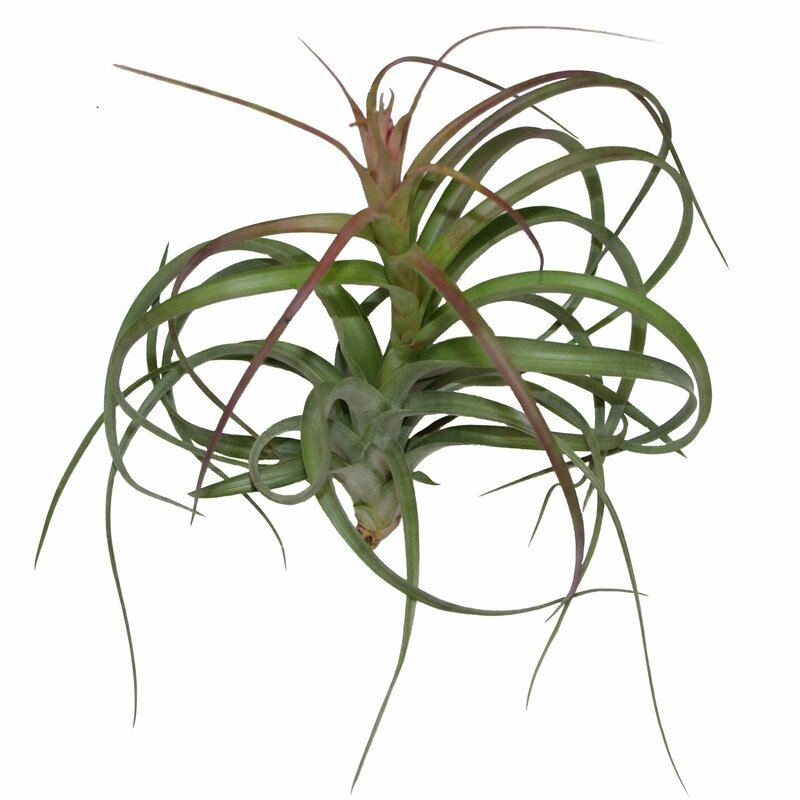 Argentea is very unique air plant from South America. 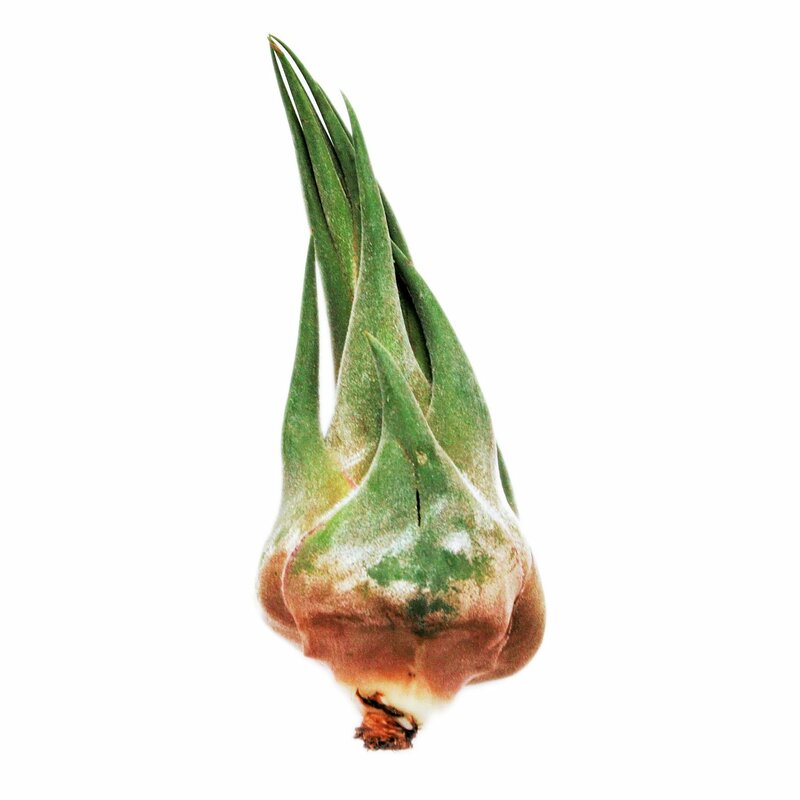 It sports silvery, thin leaves which sprout from a round base. It's bloom is held high above the foliage. They look fantastic in hanging glass globes. Can also substitute as a nose-tickling device in a pinch. The picture shown is in bloom, the plant normally does not have the tall flower. 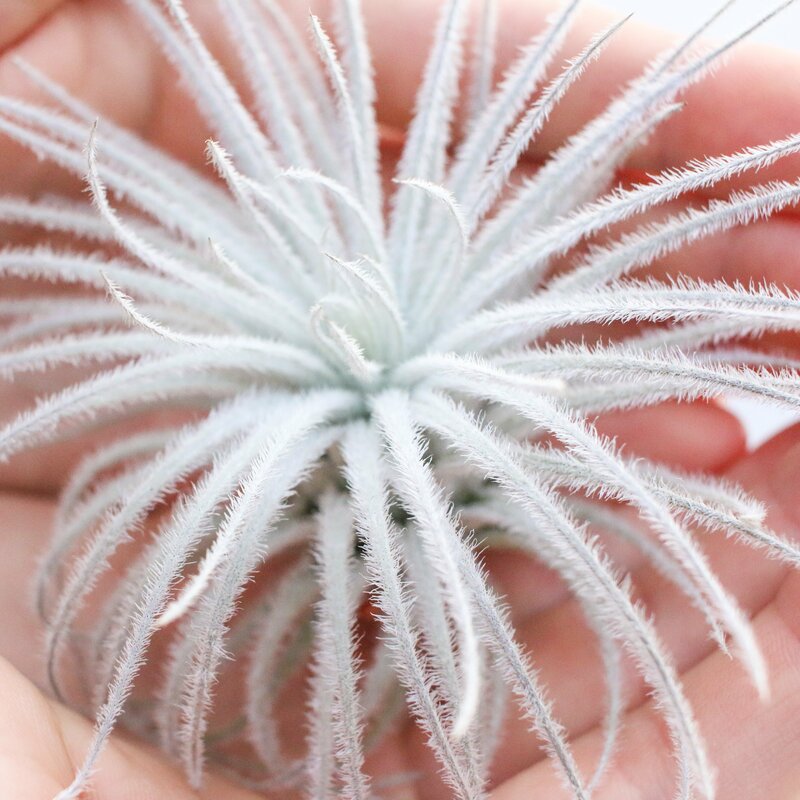 Seleriana air plants are fuzzy, sturdy plants with a lot of character. The fuzz is caused by Air Plant trichomes on their leaves that help them hold and absorb water directly through their leaves. No roots, no dirt, just the fun parts! 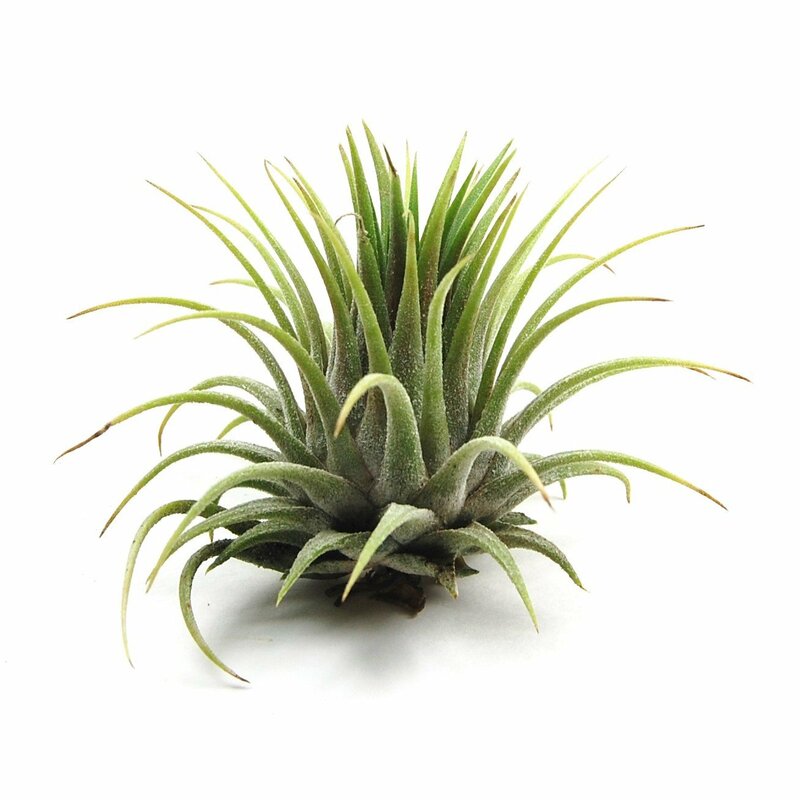 One of the most sought-after tillandsia that we have! An adorable easy care plant. The trichomes create the bright white appearance. The inflorescence (spike) is purple with lavender blooms. 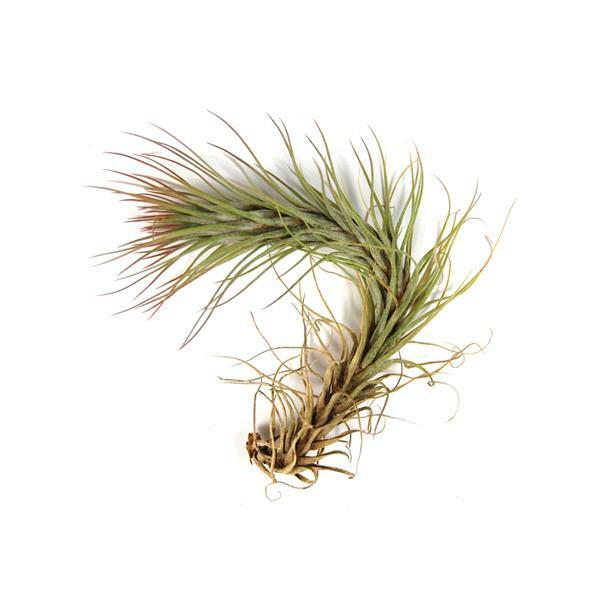 Tillandsia Tectorum likes to be misted lightly daily in a drier climate if there isn't sufficient dew in the morning or a mid level of humidity. It needs to dry rather quickly so a light to medium mist is sufficient. It does not do well in high heat with heavy humidity since it needs to dry sufficiently. Make sure it gets lots of air circulation if outdoors in humid conditions. 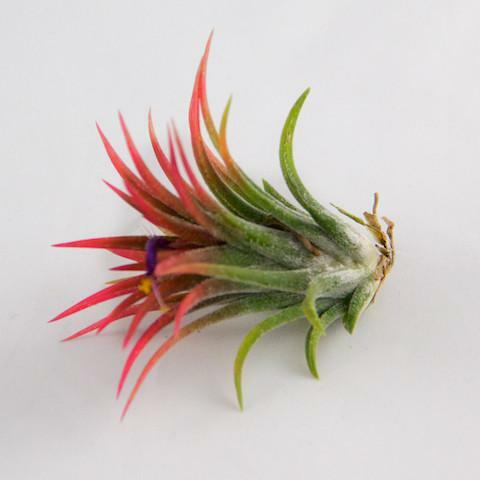 The Ionantha Fuego has short, waxy leaves that are vibrant bright green. When in bloom, these little guys display a blushing beautiful red to orange color with purple tubular flowers. 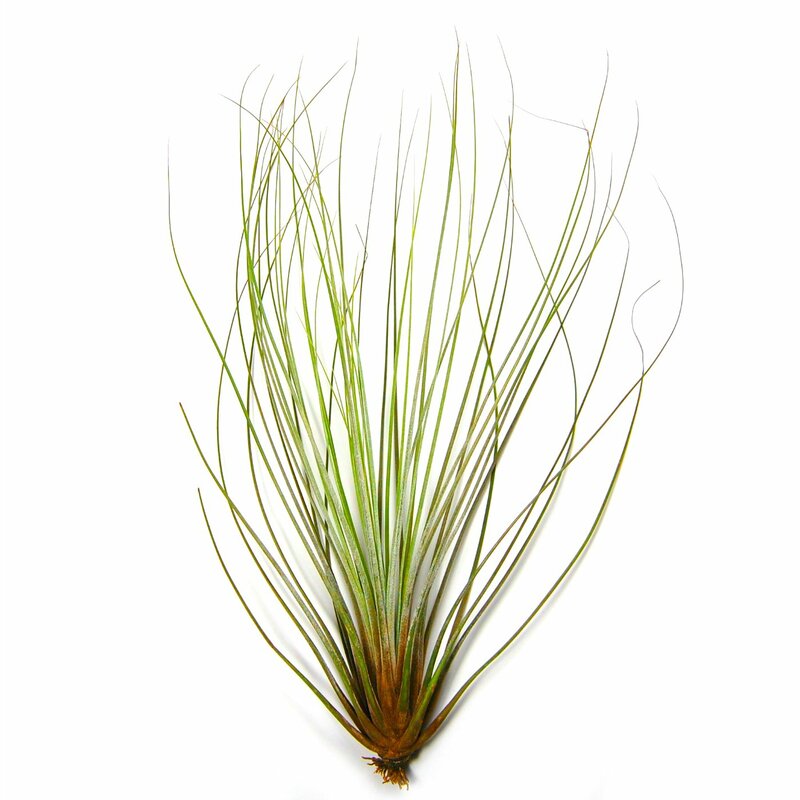 They are great for crafts, terrariums and mounting. 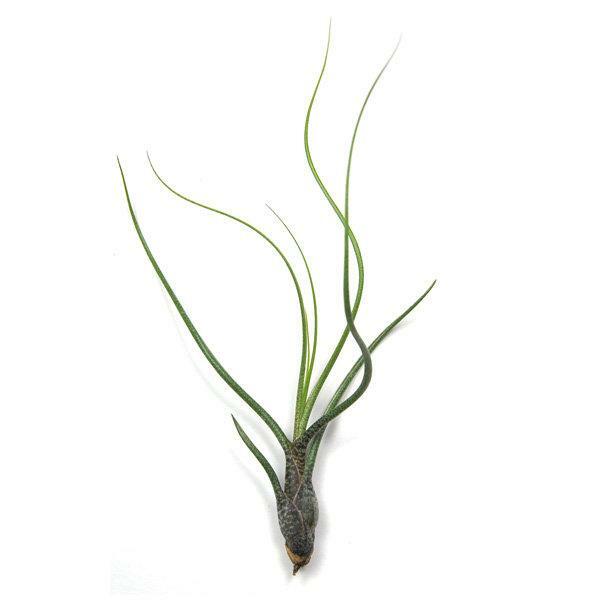 Fuzzy and silvery green in color, Harrisii has long, lovely arms that span about 3 to 4" wide. These are great for 4 to 6 inch terrariums, bowls and ceramic containers. These little Ionantha Scaposa are perfect for drilled wine corks, small seashell magnets, small terrariums under 5 inches, cork bark, driftwood and any other medium. They are very hardy and average about 2 inches tall. They will grow as large as 3 to 4 inches and multiply by producing "pups" from their base. They will give you wonderful blooms 2 to 3 times per year. 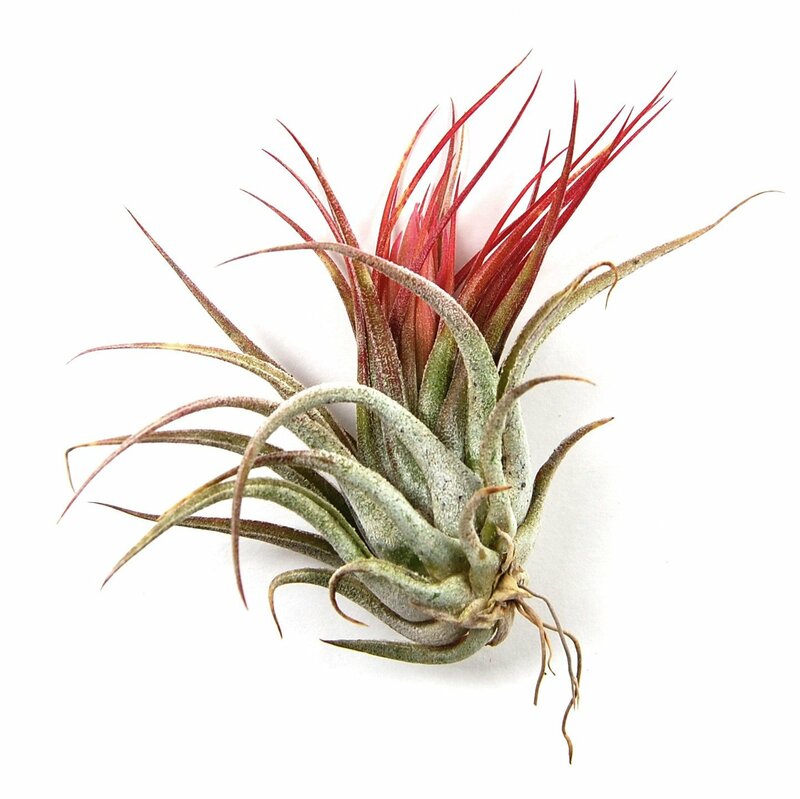 Also known as Ionantha Kolbii. 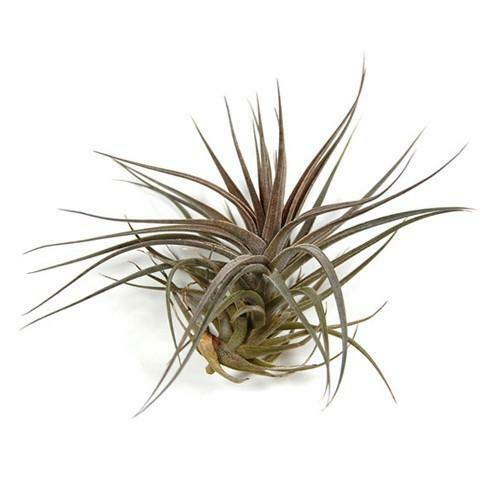 Tillandsia 'Capitata Peach' are fun, curly little air plants with gorgeous silvery green leaves. Its shape is a somewhat symmetrical rosette. When it blooms the leaves blush beautiful shades of peach and pink with spectacular purple blossom. 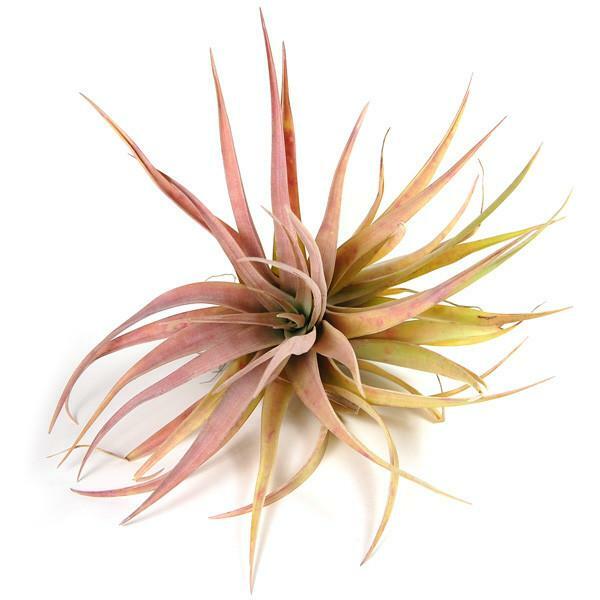 Our Capitata Peach are 2 to 3 inches wide and 3 to 4 inches in height. Magnusiana is a soft, delicate and round species with each leaf tendril covered in a thick layer of fuzzy trichomes. Often the old leaves curl under the plant to create a whimsical, droopy, appearance. 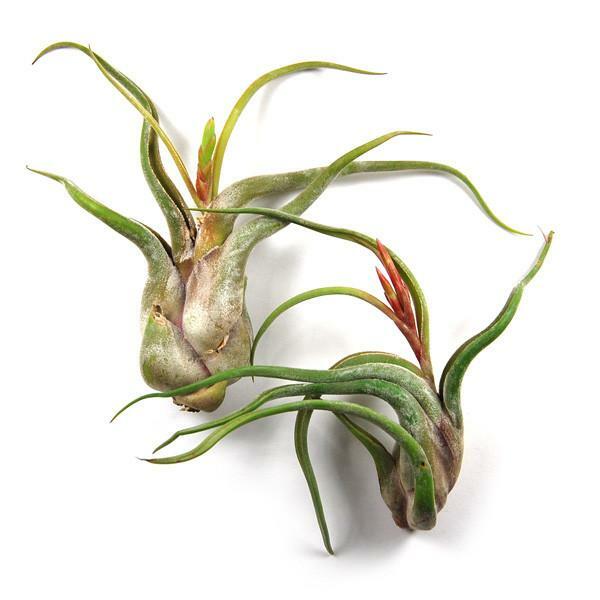 Ionantha Brachycaulos Victoriana are a hybrid air plant of the Velutina Brachycaulos and the common Ionantha species. 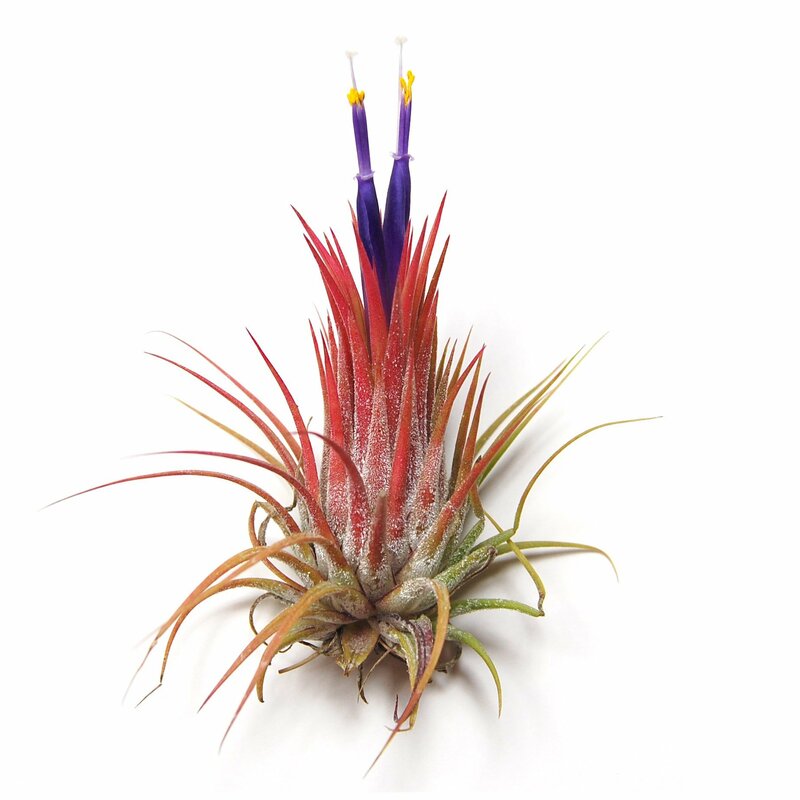 The Velutina parent brings sturdiness and height while the Ionantha enhances blooming and vivid coloration. When in bloom, they blush pink with dark purple flowers to attract hummingbirds and other pollinators.